As our gaggle of skiers sat around the campground saturday, three of us decided to try the traverse, Lee and Murray wanted to climb Big Snagtooth so they brough along rock gear figuring they could make quick work of the summit block while I borrowed their down jackets and took a nap midway through the tour. Skins back on and heading for Big Snagtooth.� I had originally thought we'd have to wrap around the east side, but when we got to the saddle just below the summit block we found a great little couloir that would take us straight towards Silver Star.� The majority of the couloir entrance was corniced, except you could walk through between the cliffs in a little slot no wider than one person to a perch at the top of the couloir. We booted up around 1500ft and hit the col...we were all very excited that the col provided a gentle entrance onto the Silver Star creek side of the mountain as it was about 4:30 and we really didn't want to start exploring an alternative exit via Willow creek that late in the day.� A quick traverse over to the Silver Star creek drainage and then we could finally put the skins away.� There was a fair amount of wet new snow on the upper mountain.� Murray skied right over a glidecrack that didn't reveal itself until the new snow had been shoved away.� Skiing into Silver Star creek was great. Coverage is still decent and we got to within 1000vf of the car.� Finished the tour around 6:00. Topo software said it was about 8.7 miles, 6300ft up and 7880 down (but with all the traversing, and Lowell's recent thread on the shortcomings of TOPO! who know how accurate that is). Damn Pete....sweet traverse! You guys sneaked-in a terrific line so late in the season. Great report, Pete. I love all the granite, larch and steep valleys back there. Thanks also for the route map. 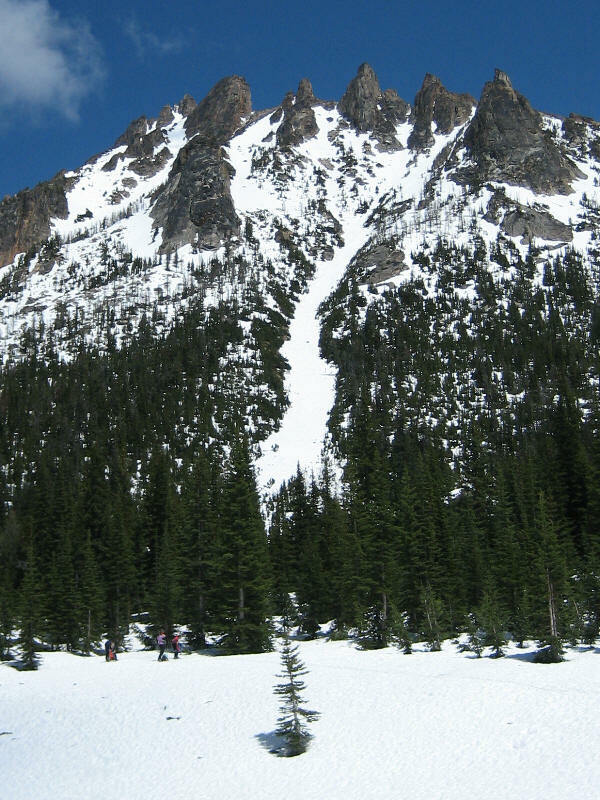 Couple questions: how steep is the exit from that narrow couloir? Is there a lot of melt low in the Cedar Creek valleys, or is most of the snowpack still intact? Looks like another east side weekend might be in store. you could walk through the 'squeeze' to get to the upper couloir and put on your skis there, the top was maybe 45 degrees but i'm not a terribly good judge of pitch. If it doesn't look good though, it didn't look too difficult to ski/walk around the east side of snagtooth to access an easier route into the northwest fork cedar creek drainage. Snow is definitely melting fast on the east side. I don't think we could've skied more than 1000vf lower than our lowest points on the traverse without running out of snow...but that was primarily on south facing aspects, north and west facing stuff had a lot more snow. Thanks, Pete. I got inspired by your report and spent a day last weekend putzing around that area. Snow's definitely getting thin, but the skiing and solitude are great. South faces are mostly gone, but north and east aspects are still pretty plump.